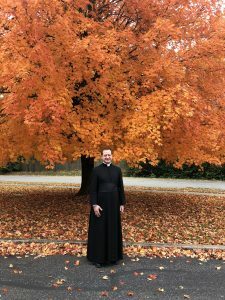 Canon Scott Smith, an American, has become the first member of the Institute of Christ the King Sovereign Priest to move to the town at the invitation of the Rt Rev. Mark Davies, the Bishop of Shrewsbury. Canon Smith, 40, will be joined by Abbe Tim Zazocek, a Slovenian seminarian, to form a fledgling community based at St Winefride’s Presbytery, Monkmoor. From Monday November 12, he will celebrate a Mass in the Extraordinary Form of the Roman Rite – sometimes known as the Tridentine rite, the Traditional Latin Mass or Old Latin Mass – in the Cathedral each weekday at 7.30am. On Saturday, Canon Smith (pictured) will celebrate Mass in Latin at St Winefride’s at 11am and on Sundays will celebrate Mass at 12.15pm. Canon Amaury Montjean, the rector of the shrine church – the first to be run by the Institute in the UK – welcomed the new foundation in Shrewsbury. “This is really a very exciting new mission because we feel even closer to the Cathedral and closer to the Bishop, as the centre of the liturgy and at the heart of the Diocese, which is a privilege for us,” said Canon Montjean. The Extraordinary Form of the Roman Rite, or the Traditional Latin Mass, was first codified at the Council of Trent under Pope St Pius V in the 1560s and was last modified by Pope St John XXIII in 1962. It is celebrated in Latin with the priest leading the faithful in facing east. Its use was limited during the liturgical reforms that followed the Second Vatican Council of the 1960s in favour of the new rite, or Ordinary Form, of the Mass in the vernacular with the priest facing the congregation. In 2007 Pope Benedict XVI released Summorum Pontificum, a document issued “on his own initiative”, permitting the rite to be used wherever a “stable group” requests it.